Well I figure it is probably time to put up a build thread. 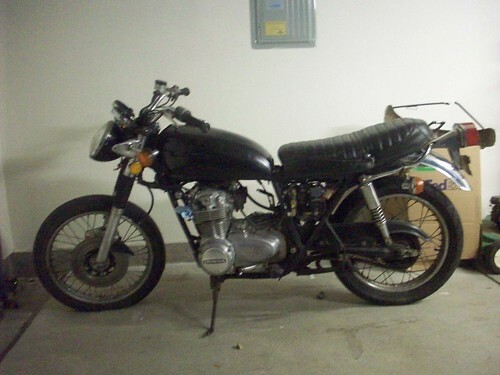 I bought a 1974 CB550 back in November from TurdFurguson who got 2 in a package deal for $400. I of course got the non-running bike. Anyway, I have finally started working on it. 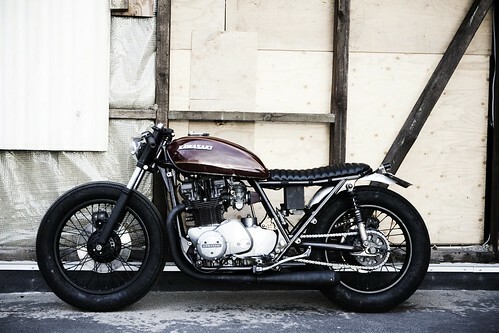 My original goal was to build a cafe bike complete with a custom single seat. My wife said that if I was getting a bike, she had to be able to ride too (I am ok with this because now I can build another bike...getting ahead of myself ). I toyed with the idea of having a removable cowl so she would have a spot to sit but I came across www.wrenchmonkees.com and loved the style of their bikes and decided that was the direction I was going with. I posted it here in the Bob/Chop section because I don't know if I would classify it as a Cafe....maybe a Cafobber or Bafe? 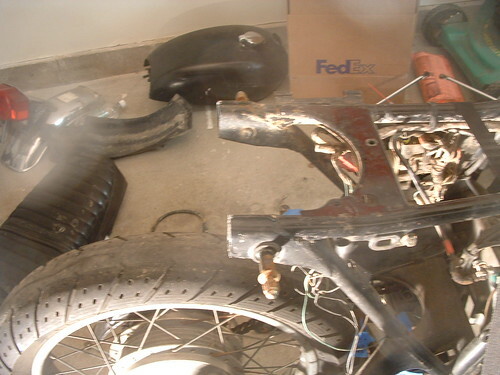 So.....Now I am really getting into the project and the goal is to have it up and roadworthy this spring. I really want to make it to Troy's in July! 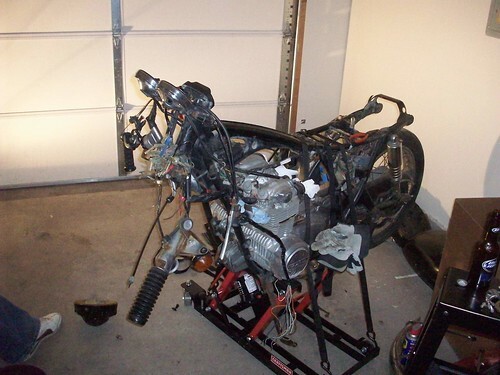 This won't be a complete build as far has stripping everything to the frame. That will be in the works next winter. I know you might think that it is "half-assed" but this is my first bike. 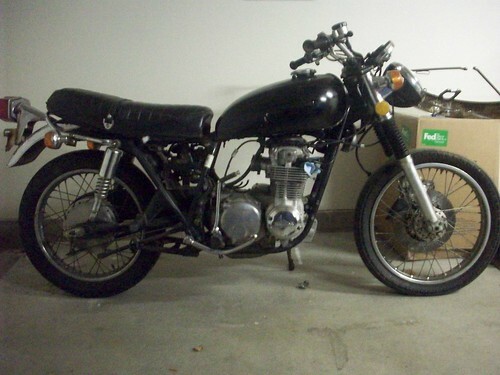 I just got my license this last fall and would really just like to get out and ride this next season. 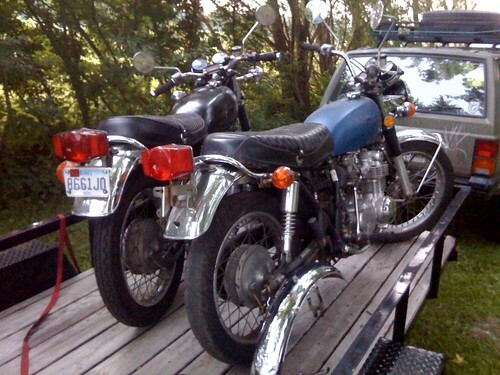 Here are the 2 bikes when Jordan (TurdFurguson) picked them up in June 09. 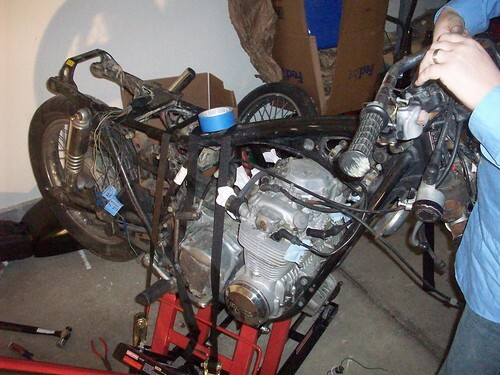 As you can see I have my work cut out for me....I have already rebuilt the carbs and have more of the bike pulled apart. I will update it with some newer pics tonight! Thanks for looking!! TF came down and we did some work last night...mainly beer drinking and commenting that I will never get this done...haha! 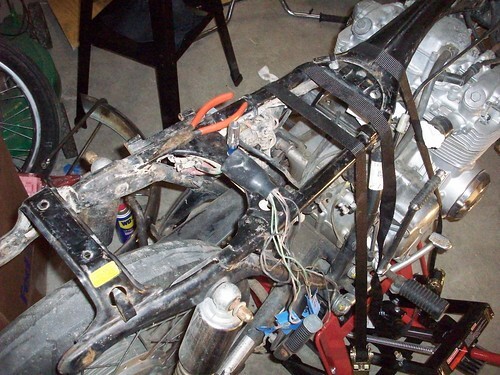 Got the rear stripped down, undid the mess that is the wiring located in the headlight and managed to get them all pulled out of the bars. I am pretty much at the point to start rebuilding. 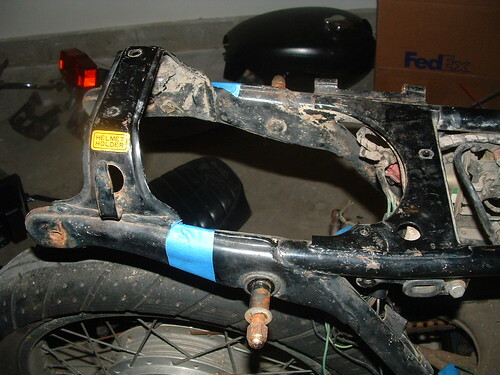 I need to cut the frame and get the tubing necessary to to form/weld a hoop on the rear. Once that is complete, I am going to mock up a seat pan and then get one laser cut and form it here at work. This is the look I am going for....I am thinking it would be classified more of a Cafe?? i love, love, love the wrenchmonkeys style!!! cant wait to see the progress! "He who works with his hands is a laborer. He who works with his hands and his head is a craftsman. He who works with his hands, his head, and his heart, is an artist." thanks man...I promise to keep this thing updated! I think their style is a good cross between cafe and bobberish...perfect for what I want! 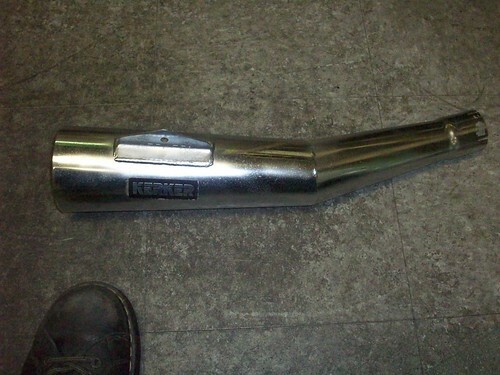 A while back I scored a Kerker 4-1 for super cheap but it was rather rusty. 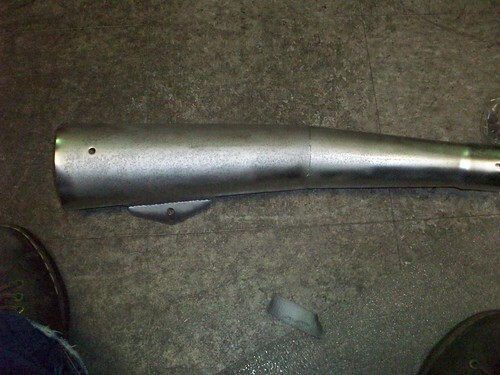 I just got done doing some sandblasting and I think it came out pretty good. A little bit of sanding by hand and it will be ready for paint. That pipe came out alright man. You should blast all the chrome off, and get it powdered. 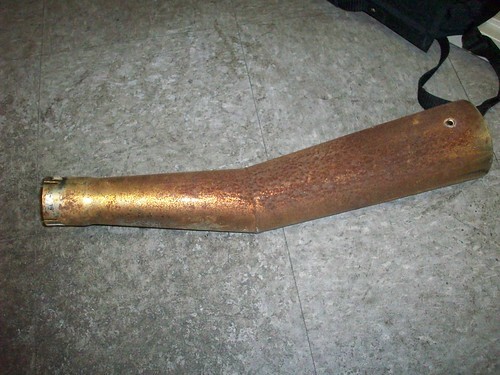 Shouldnt be much for just that pipe. 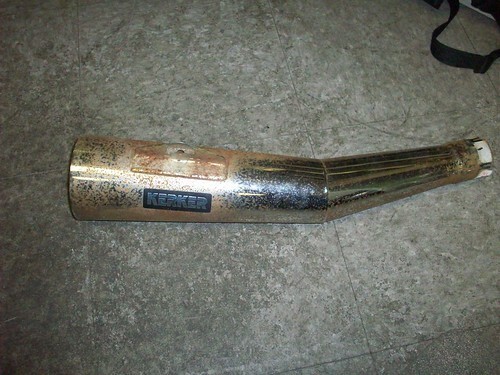 Yeah I gotta sand the rest off but I am going to paint it with a satin black high-temp paint along with the headers. I did a little bit of surgery last night, well more of an amputation for now. Now to find some tubing to finish the rear hoop.